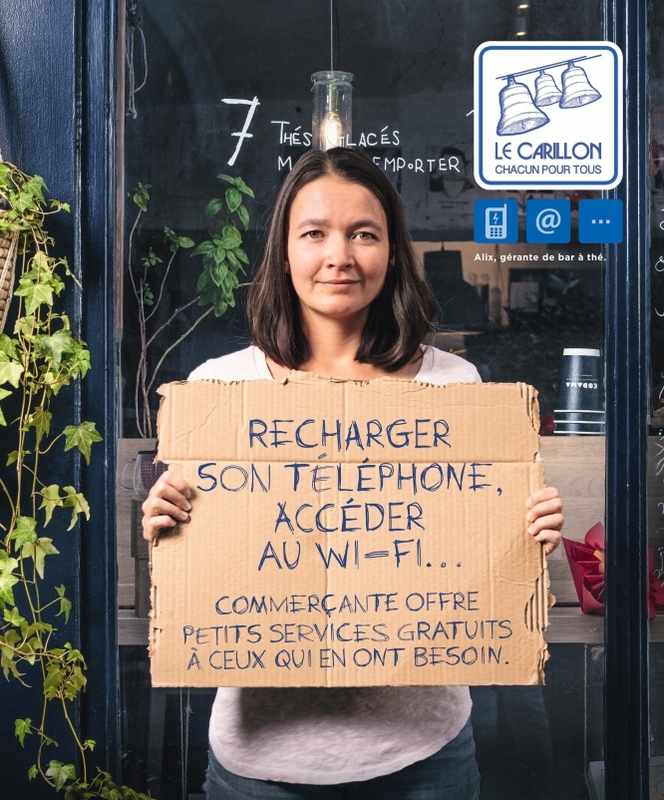 The Le Carillon project (lecarillon.org) has signs for shopkeepers or restaurants to put in their windows to show what services they can provide. This could be access to a telephone, internet, a meal, a haircut, toilets or a glass of water. La Cloche, an association to help the homeless, hopes the idea will spread through an international network. Communications officer Mathias Mourier said there are estimated to be around 150,000 homeless people in France. Many citizens want to help, but do not know how. Allowing homeless people to feel part of society is a key part of the association’s work: “We always include them in our decision-making procedures and they work as volunteers with us alongside the public. Gilles Martel, 55, became homeless 15 years ago. He now does voluntary work for Restos du Coeur, which helped him find a room, and he is also an ambassador for La Cloche in Paris. He said: “I was attracted by the concept that homeless people work alongside other volunteers. The symbols are very helpful. If you need to go to the toilet and there aren’t any public ones nearby, it is good to know a café or restaurant will let you use theirs without having to buy a drink. “Many of the people have been on the streets longer than me and find it hard to do normal social activities. La Cloche also gives training in how to approach someone living on the street. “People may be worried that a coin will only be used for alcohol,” said Mr Mourier. Mr Martel says it is best to make contact with someone gradually: “If you pass someone in the same place every day, start by giving a smile. It is lonely being on the pavement. Some 800 shopkeepers are signed up in 16 arrondissements in Paris, Nantes, Lyon, Lille, Marseille, Bordeaux, Strasbourg and Toulouse. La Cloche has an international platform (thechime.org) and you can get involved by organising events, meeting people on the streets or looking for local shopkeepers to join in.